For Sale: Great industrial concrete warehouse and manufacturing building available for a buyer to purchase. 35,750 square feet of building including roll down security shutters on all windows and 600 amps of 480 volt power. The City of Commerce in recent months passed an ordinance legalizing several types of cannabis operations in the city including cultivation (growing), manufacturing, and distribution. Don’t miss this opportunity. Whether you have applied for a cannabis permit or are simply a real estate investor wishing to lease to the industry, get in before everybody finds out about the recent allowance of marijuana operations in this city. Contact us for a brochure on this property. Classic Brick Buildings, BowTruss Roof Roof, Great Natural Light. Creative Campus conversion: art gallery, live/work. Warehouse, Manufacturing, or Cannabis/Cultivation/Growing Uses. 1,200 AMPS of power, 120/240 Volts, 3 phase. Adjacent to Slauson Central Retail Plaza: Starbucks, Fatburger, etc. 10 minutes south of DTLA Arts District. A 16,570 square foot building was leased to a company that prepares school lunches. The building was located at Alameda and 21st Street, and was formerly occupied by a seafood processing and packaging company which focused on shrimp products. Included in the long term lease was 2 cooler boxes, a 22 foot high freezer, and a large food processing room with washable walls and floor drains. The prior tenant relocated to a seafood building in the South Bay that was approximately 12,000 square feet in size. One broker coordinated the simultaneous transactions and the entire deal spaned several months. 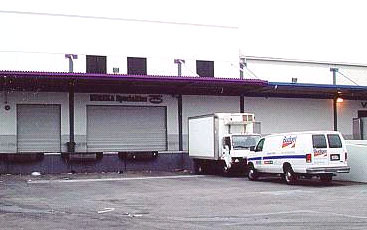 An 18,000 square foot warehouse was leased to a Downtown Los Angeles produce company on Industrial Street. The building included an unusually high number of dock high loading positions for an older building: eleven. The produce company was attracted to the building for its proximity to the produce market ,the fact the building had 3 refrigerated coolers, and there was sufficient yard space to accomodate large 53 foot container trucks. Marengo St- Cooler and freezer with dock high loading for a 10,000 SF facility. Forlease. Main St- USDA food processing facility built in 1999 with 5000 SF freezer, 2500 SF cooler and 5000 SF processing room in 26,000 SF of improvements. Great for poultry, beef, seafood processors. Anderson St- 11,000 SF building with freezers, coolers and truck high loading. Industrial St- 23,000 SF building with 6000 SF freezer and 1200 SF cooler and 7 dock high spots. 6th St- 23,000 SF concrete building with 3000 SF cooler and 1100 SF freezer, 16 truck high positions and 22 foot clear. Alameda St- 15000 SF building with 8000 SF cooler and 4 dock high spots. Great location for produce distribution. Alameda St- 16000 SF building with 4000 SF of coolers and freezers and processing room. 3 truck high spots. Spring St- U.S.D.A. federal inspection facility for poultry and meat processing with coolers and freezers. 17000 SF building. Triangle Dr- 23000 SF building, former commercial bakery with coolers, freezer and processing rooms.